Boldman was contacted by an energy provider that was in need of an access platform to carry out essential maintenance works replacing glass panels on the roof of a nuclear power station. The solution currently in use was scaffolding and wooden boards, which was leading to safety concerns surrounding how the materials performed in adverse weather conditions. 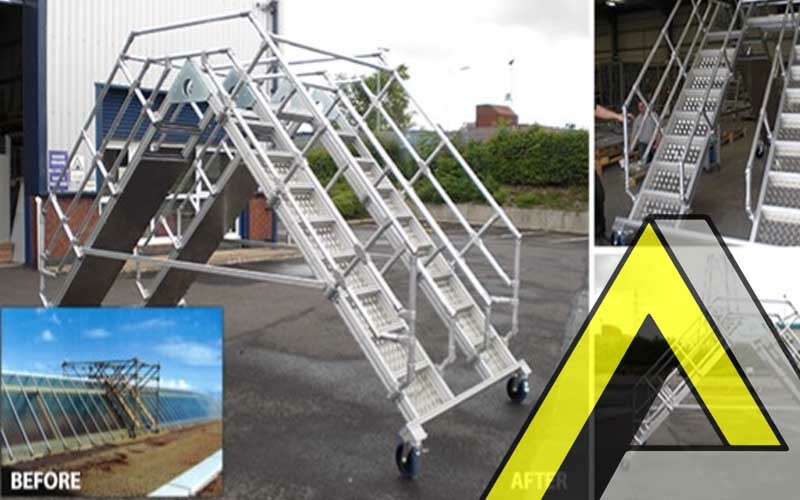 The access frame needed to be of a lightweight, durable material suitable for outdoor work, it also required safety railings given that the maintenance works were to be carried out at such a great height. Boldman’s team of engineers worked closely with the customer to design and manufacture a bespoke modular Apex framework platform. The work platform was fitted with a twin set of steps allowing two people to lie down safely within the upper and lower guardrails and work within the central opening to replace the roof panels. Stress testing and calculations ensured the frame could safely carry two persons at one time with a safe working load of 500kg. The Apex frame was designed, manufactured and delivered to site fully assembled using Boldman’s anodised aluminium profile system and was hoisted up onto the roof using a crane. The Apex frame was fitted with suitable locking positional castors and brake mechanisms including channels to guide the frame during movement over the apex roof glazing. All materials used in the platform were to be suitable for outdoor use; the infill between the profile on the step sections was aluminium tread plates. The platform was also supplied with two ramps for pushing the A frame over the roof expansion joints.